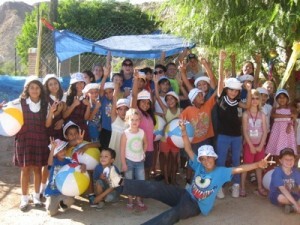 My family and I just got back from our first family mission trip to San Felipe, Mexico. Rather than play and hang out during Fall Break, we packed our bags and headed to some warmer weather in Mexico! Me, my husband, and our two older kids went along with 34 others from our church to Sonshine Hacienda, a small orphanage in the heart of the city. Our plan was to conduct a Vacation Bible School at the Hacienda and at a local pastor’s house, as well as do some construction projects. I’ve been on several mission trips before, to Mexico in fact. I honestly wasn’t expecting to have an “earth shattering” experience – I knew what to expect, I knew we would be surrounded by poverty, I knew it would be dirty, I knew there would be lots of trash in the streets, I knew the public sewage system would have it’s limits and that we could not flush toilet paper or drink the water, and I knew that the kids would be amazing and that they would giggle trying to understand my attempts at simple Spanish. I was expecting all of that. And all of that was true yet again. It’s not that the Lord didn’t teach me anything and that I wasn’t impacted by everything we did. What did happen is that very subtly the Lord taught me some powerful lessons about myself. God wants me to share all of me, my abilities, my talents, my thoughts, and the entire journey of my life with others to glorify Him. God solidified a dream that I’ve had for years and is calling me to fulfill it. I know all of that can sound cliché’, but for me in midst of singing songs, crafting, coloring, playing games, and teaching kids about the Love of Jesus I was reminded that just because I can’t take the best photos of the kids, or run the fastest when chasing them outside, or sing in tune when we sang songs, God still gave me a lot of talents and life experiences that He calls me to share in the place He has planted me. Not everyone can drop everything and head to a far off place to “serve”. But you can serve wherever you are. God has planted me and my family in the exact place he wants us to be, in the community He wants us to serve in and although the “service” looks different than it did in Mexico it’s still “serving”. It’s the same for you to. The dream I’ve had for years has been an idea swirling in my head – but it’s been an idea that was so disjointed. It’s exactly this – what I’m doing right now – it’s a dream to share my life with others. To share my experiences, hobbies, talents, ideas, and lessons with moms to offer encouragement, grace and a most importantly, help. Help to get through this thing we call ‘Life’.